(Ottawa, March 26, 2018) - This Healthy Schools Day, April 3rd, the Canadian Partnership for Children’s Health and Environment (CPCHE) and the Canadian Child Care Federation (CCCF) will launch a national petition urging mandatory action on radon in schools and child care programs across the country. The Rule Out Radon petition is accessible at www.healthyschoolsday.ca. Erica Phipps, CPCHE’s Executive Director explained why: “To reduce the exposure of children to the dangers of radon gas, this Healthy Schools Day we are asking parents, educators, students - and anyone concerned with the well-being of Canada’s children - to make their voices heard by signing the Rule Out Radon petition." Radon exists in all regions of Canada and is the number one cause of lung cancer among non-smokers. Formed by the gradual breakdown of uranium found in rocks and soil, radon is a radioactive gas that can seep through foundations and build up to harmful levels indoors. Since radon is both colourless and odourless, the only way to know if radon levels are too high inside a home, school or other building is to test for it. Testing is simple and inexpensive. If elevated levels are found, the problem can be fixed. Despite some recent progress, most jurisdictions in Canada still do not require radon testing in schools and child care programs. May 2017: BC Interior Health Authority made radon testing a requirement for all licensed child care facilities. An earlier voluntary program resulted in about half of facilities in the region being tested. December 2017: Alberta announced it will require child care programs to supply radon test results and, if applicable, a remediation plan as a condition of receiving or renewing a license. August 2011: province-wide initiative was launched to test all 3,600 public and private education buildings. October 2017: Yukon announced it will make radon testing and mitigation a licensing requirement for new and existing child care centres and day homes. The extent to which testing has taken place in child care facilities is largely unknown. Recent policy announcements by the Yukon, Alberta, and BC Interior Health Authority to require testing in child care programs suggest the issue is starting to garner the attention it deserves. “The well-being of children attending child care programs across Canada, and the women and men who work in them, must be a priority. Radon focused regulations and licensing need to explicitly make testing mandatory in the jurisdictions that are lagging behind,” concluded CCCF CEO Don Giesbrecht. This radioactive gas formed by the gradual breakdown of uranium found in rocks and soil, can seep through foundations and build up to harmful levels indoors. Radon exists in all regions of Canada and is the number one cause of lung cancer in Canada among non-smokers. Long-term exposure to high levels of radon is the number one cause of lung cancer in non-smokers. A person exposed long-term to high radon levels has a 1 in 20 chance of developing lung cancer. If there is also exposure to cigarette smoke, this risk increases to 1 in 3. You can’t see, taste or smell it. The only way to find out the level of radon in an indoor space is to test for it. Testing for radon is easy and inexpensive. In Canada test kits for homes cost between $35 and $50, while professional testing runs around $150. If high levels of radon are found, a radon professional can reduce the levels by installing a pipe in the basement floor with an exhaust fan that draws radon from below the basement floor through a pipe to the outdoors, or by increasing ventilation and sealing cracks and openings in foundation walls and floors. Children and staff spend between 1500 and 2500 hours per year in schools and child care facilities, which may have elevated levels of radon. In 2016, the Chief Public Health Officer of Canada recommended that schools, homes and workplaces be tested for radon. Health Canada recommends that all public buildings, including schools and day cares, be tested. •	All public schools in Saskatchewan, New Brunswick, Nova Scotia, Prince Edward Island and the Yukon have been tested for radon. •	British Columbia, Alberta, Manitoba, Ontario, and Newfoundland have low rates of radon testing in schools. •	Quebec has a collaborative approach to radon testing in schools led by the ministries of Education and Health, which is a product of the Inter-Sectoral Committee on Radon. •	In 2018, 500+ Canadian schools expressed interest or developed plans to test for radon. 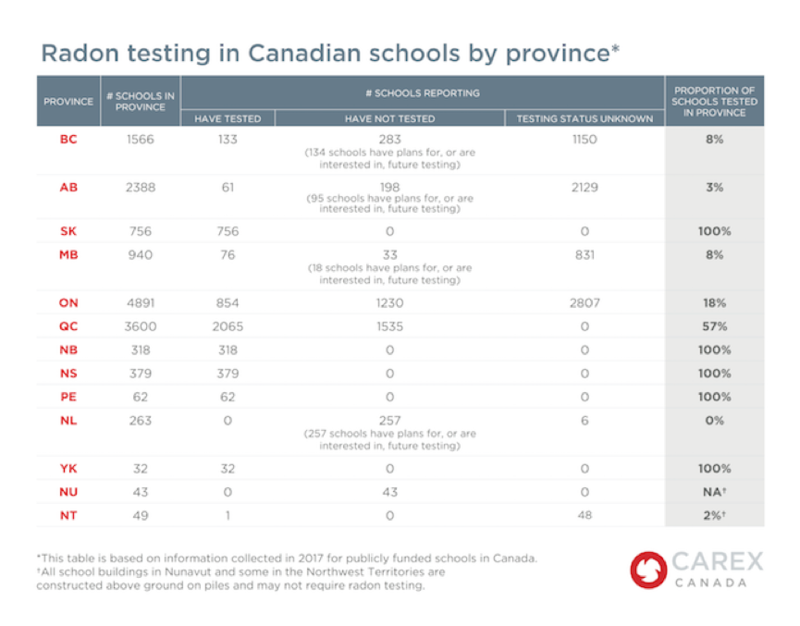 •	Only Prince Edward Island and Yukon make all school testing results openly available to the public. The Canadian Partnership for Children’s Health and the Environment (CPCHE) is a national collaboration of 16 organizations with expertise in public health, medicine, environmental protection, disability advocacy, law and policy, research, and early childhood education. Since 2001 CPCHE has been working to advance the protection of children’s health and development from the risks posed by toxic chemicals and pollutants. (www.healthyenvironmentforkids.ca).